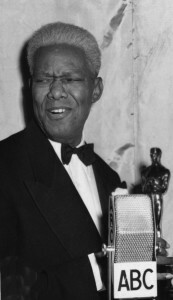 Born in Indianapolis, actor James Baskett was on stage in musicals and was a radio actor, best known as ‘Gabby Gibson’ on the popular “Amos and Andy” show (1944-48). He made a number of films, the last being Disney’s “Song of the South” (1946), in which he played ‘Uncle Remus’ and received an Oscar. Baskett died at age 44 in Los Angeles September 9, 1948, and is buried in his hometown of Indianapolis.